ONE is a rookie forward, with dreams of greatness, whose flurry of goals are providing the fireworks in the Castle Lager Premiership, while the other is a shining symbol of defiance, driven by an indomitable spirit, which has lifted him from the depth of despair.Whether it’s Edmore Chirambadare, whose stunning goal at Rufaro on Sunday announced his arrival on the big stage, or Raphael Manuvire — who has amazingly bounced back from a horrific injury to lead the race for the Golden Boot — the refreshing stories in the domestic Premiership are coming from the kraals of the lightweights. And, when the marathon continues today, with half-a-dozen league matches, including two glamour fixtures — a top-of-the-table showdown between Chicken Inn and Triangle at Luveve and Harare City hosting ZPC Kariba at Rufaro — the two men whose goals have illuminated the domestic Premiership will certainly be under the spotlight. Chirambadare is a name synonymous with Zimbabwean football — a bearded swashbuckling left-back called Stanley, and nicknamed Samora, who left his mark in the colours of Dynamos in the ‘80s, and his younger brother, goalkeeper Ernest, was part of the Glamour Boys side which reached the final of the CAF Champions League in ’98. Today, a 22-year-old man from Gweru, who shares their famous surname, is making waves in the domestic Premiership, in his first season in the top-flight league, opening his goal account just 40 seconds into his debut game against Flame Lily. His teammates call him Spanner and he has been turning the screws on opposition defences, as if he has been around the Premiership for years, and his double against DeMbare on Sunday, including a beauty just after the interval, could be a defining moment in his career. It has been quite a dramatic transformation for Chirambadare who, just three years ago, was playing in the National Youth Games where he made a huge impression in Gwanda, the officials of Tsholotsho FC decided to take him into their fold, making him the spearhead of an attack they believed would take them into the Premiership. Last year, Chirambadare exploded, as he led the line of Tsholotsho, scoring 13 goals to win the Southern Region Division One Golden Boot and the league’s Player of the Year award, as he inspired his team into the top-flight league. In one of those Division One games, against Black Boots, Chirambadare was outstanding Chicken Inn coach, Joey Antipas, who was watching from the stands, decided he was the man he needed to add firepower to his team’s attack. 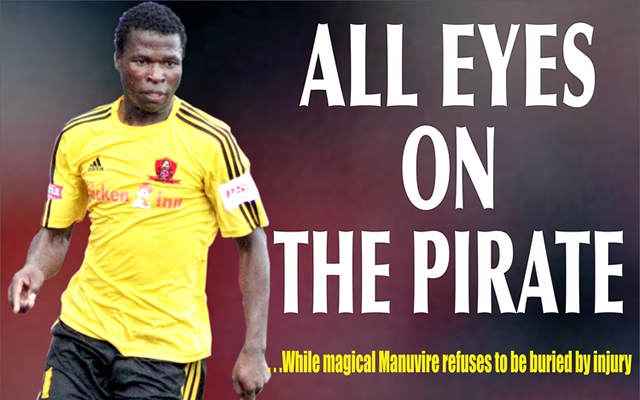 Chirambadare accepted the challenge and, just 40 seconds into his Premiership journey, he scored against Flame Lily, and any doubts whether he could make it on the big stage — three years after leaving his hometown team Gweru Pirates — evaporated within just a minute. Five goals in as many matches, including that unforgettable double against DeMbare, especially the first one that oozed class during its flight from his boot into the nets, have turned the former Gweru Pirate into one of the hottest players in the domestic Premiership. “He has brought in a fresh breeze into our attack. I spotted him last season when he was playing for Tsholotsho FC against Black Boots and his vision, skill and knack for scoring caught my eyes,” Antipas told our sister newspaper, Chronicle. “I knew then that I wanted him and the rest, like they say, is history. Antipas has worked with a number of quality forwards, in a career that has seen him win a league championship with Motor Action, and for him to be showering all that praise, on a rookie forward in the Premiership, shows that Chirambadare might not be ordinary. “The guys at Chicken Inn have been very supportive and the senior players are always encouraging me to work harder,” said Chirambadare. “It feels good to be part of the team and, hopefully, all my hard work will be rewarded with a national team call-up or a deal overseas. “Playing for Chicken Inn is a challenge and it’s my desire to improve my game that made me join them. Tsholotsho FC also wanted my services but I wanted another challenge in life. If he can find the target again today, in the big clash against Triangle, he will certainly be moving in the right direction. The Golden Boot race, right now, is led by Manuvire who, just a few months ago, appeared down and out after suffering what appeared to be a career-ending injury at Gwanzura in a league game against Chapungu. Incredibly, the attacking midfielder, who was the best player in the domestic Premiership when he was injured, has made a stunning recovery and now leads the Golden Boot race with six goals from seven matches ahead of today’s match against Harare City. “I am happy about the way I have played and I know there are a lot of expectations but I am not worried about that, all I am looking for is to improve my game and hope to do well for the team and myself,” said Manuvire. Given what he has gone through, in the past year, there will be many fans who will praying that Manuvire lasts the distance this time around and, if that happens, we could be in for a treat from the attacking midfielder who can score goals.